Hi. I'm hoping someone can help me. We are trying to clean up our Vendor listing by making Vendors we haven't used for a while inactive. 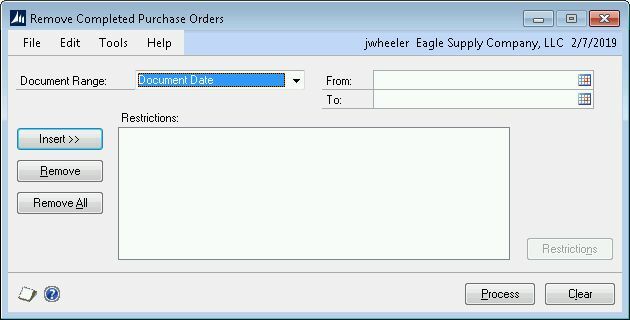 The problem we are running into is we are receiving an error message that says, "This Vendor has been assigned a Purchase Order or an unapplied receipt. The status can't be changed to inactive." We are noticing this is happening on Vendors that have been in the system a long time. We have checked and there are not any open PO's for these Vendors, or unapplied receipts. Has anyone else run across this problem and if so, were you able to get the Vendor marked inactive? It appears that you have made the correct steps to verify that there are no open documents for these vendors. One thing that I would recommend, if it has not already been performed recently, is to have your system administration person run the Check Links function. They can go to Maintenance - Check Links - Purchasing and perform this. They would know to perform this preferably when there is no one logged in. We have this issue because there are certain POs that are not put into History but we may never use the vendor again. Since we couldn't mark these vendors Inactive due to being active on a PO we created an "Inactive" vendor Class ID so we can use that as a sort. To prevent those vendors from being accidentally used, we change the Name, Short Name and Check Name to INACTIVE. Have you run the Remove Completed Purchase Orders routine? Below is a screen shot of the window. You could run it by Document Date and it will move the completed PO's to history. I would try that to see if it helps with your vendor issue. Thank you so much! That worked and now I'm getting our Vendor List cleaned up! This was something we didn't know anything about, so needless to say we will be running it periodically from now on. How often do you run it? NOTICE: This communication may contain confidential and privileged information that is for the sole use of the intended recipient. Any viewing, copying or distribution of, or reliance on this message by unintended recipients is strictly prohibited. If you have received this message in error, please notify me immediately by phone, fax or e-mail. We run the Remove Completed Purchase Orders once a month.